SD-WAN is best defined as traffic monitoring and management from physical devices to the application itself, capitalizing on flexibility and agility.  This intelligent routing is abstracted into a virtual overlay, enabling a secured pooling of both private and public connections allowing for automation, centralized network control and real-time management across multiple links. In other words, SD-WAN is able to take multiple sources of Internet, optimize them, control the network flow, and provide seamless failover. The primary purpose of a Site to Site solution is to displace or augment an existing private network. Site to Site SD-WAN solutions communicate from edge device to edge device using instructions from a centralized orchestrator. Using this strategy, we can increase bandwidth, create automated failover, and performance optimization over a private/public network while reducing costs. If you are using private MPLS/VPLS or VPN tunnels across Internet for connectivity between sites now, a Site to Site SD-WAN model can make this configuration more robust by providing multiple paths to all locations, save money by displacing your existing MPLS/VPLS environment, and provide better visibility across your network. Matrix Networks primary partner for Site to Site SD-WAN is Velocloud. 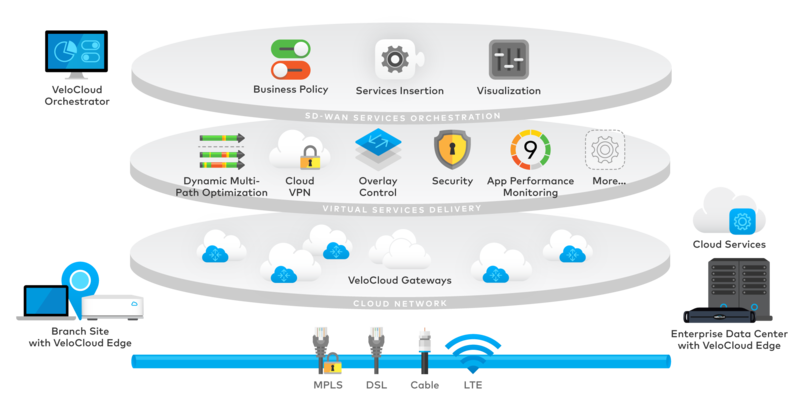 A Cloud First SD-WAN solution is not focused on displacing your private network, instead the solution specializes in optimizing your cloud application experience. The design works perfectly for single site, fully cloud, or multi-site organizations without the need for site to site meshing. The cloud only design revolves around edge gateways communicating to the SD-WAN provider’s main equipment, which has been strategically placed in datacenters that house major Internet peering points. If your goal is to mesh sites using your existing firewall solution while you migrate to the cloud, this solution is designed for you. With over 40 SD-WAN solutions on the market today, it can be difficult to know what solution is right for you. There are critical questions that must be asked in order to identify which style of SD-WAN is a match for you. Questions like: Will this solution work with my existing Security appliances? Will I have access to the Orchestrator? What type of SD-WAN solution is it? Is that solution Appliance-to-Appliance, aka Site-to-Site? Here at Matrix Networks, we have narrowed down the field down to the best in breed Cloud-first and Site-to-Site options, being Bigleaf Networks and Velocloud respectfully. 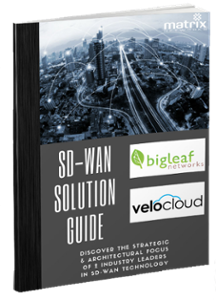 If you'd like to lean more about these two solutions, download our complimentary SD-WAN Solution Guide. "Everything you need to know before you select an SD-WAN Vendor"
Today's modern businesses are more dependent on their network infrastructure than ever before. As applications continue to move to the cloud, organizations must have the correct foundation in place to handle the influx of bandwidth needed to support a successful user experience. The articles written below are meant to educate our clients on the power of SD-WAN technology and the importance of building a modern network infrastructure.